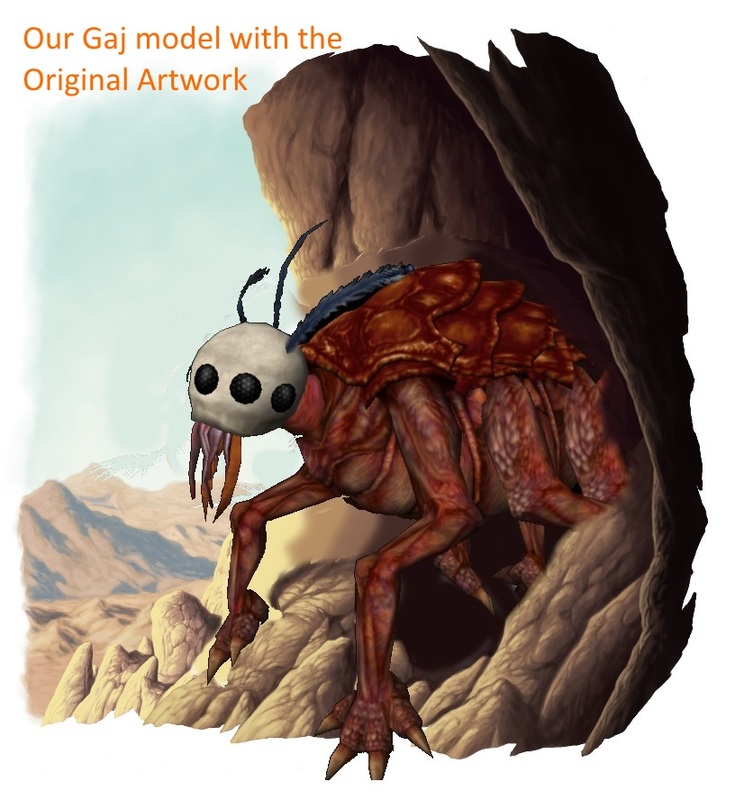 We have Shemsu-Heru to thank for making our Gaj creature for our NWN Dark Sun project. 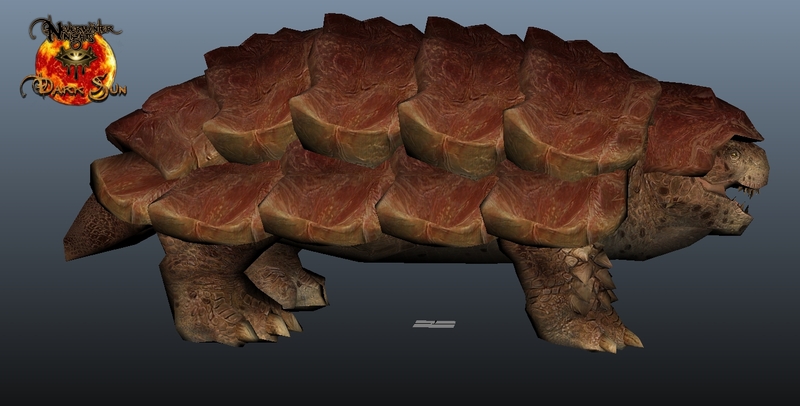 Shemsu-Heru is just one of 8 3D module creators we have creating custom content for our project. As you can see from the pictures we are really trying to create content to look as close to the art work as we can. Now we know its not 100% but we do have limits to what all we can do when using NWN, plus we are only a group of community members who are doing what we can in our free time. Even though we have a very Large team we are still always looking for more people who would like to help in some kind of way. Some core areas but not limited to that we could still use some help in. Classes we could use a small team of people working on the Dark Sun classes, mostly 2da (text) work. If this sounds like a project that you would enjoy helping with in one way or another then contact me and come join our team. We would like to thank Draygoth who is part of our team for creating the Crodlu Chariot. 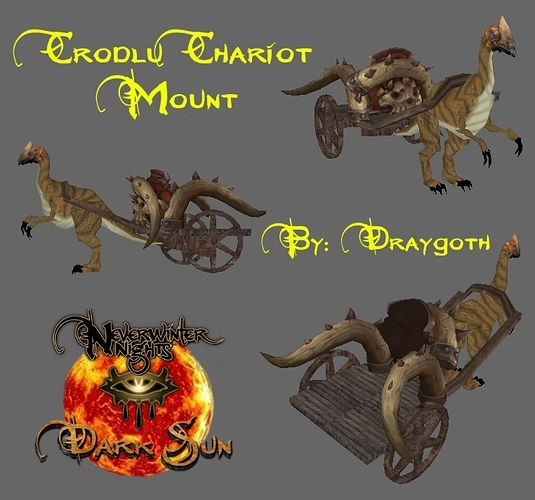 He is also working on another Crodlu model along with a chariot that is pulled by two crodlus. Dark Sun is a campaign world of that has been shown a lot of love across all kinds of RPG additions from 2e, 3e, 4e, 5e, and even Pathfinder. This has lead a group of us to come together to recreate this campaign setting in a 3D game world using NWN. 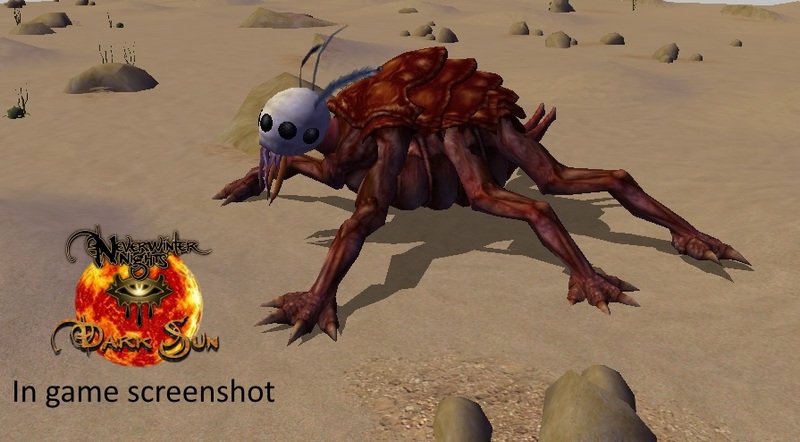 We are creating all new custom player races, creatures, weapons, armor, items, placeables, Tilesets, along with new music and sounds. This project is about really creating the Dark Sun setting the way it was meant to look and feel. If this sounds like a project that you would enjoy helping with in one way or another then contact me and come join our team and Discord Channel. That creature so reminds me of a beast called a Gagglzoomer, from an ancient cartoon called Snarfquest written and drawn by Larry Elmore. Looking through the ancient issues of Dragon Magazine that I acquired some time ago it appeared in a number of issues. Draygoth is part of our team, who has been hard at work on creating a lot of the Dark Sun creatures we are using for our project. We currently have a really large team, however we are still looking for more people who would like to help with this project in one way or another. What is Dark Sun? What is this project about? 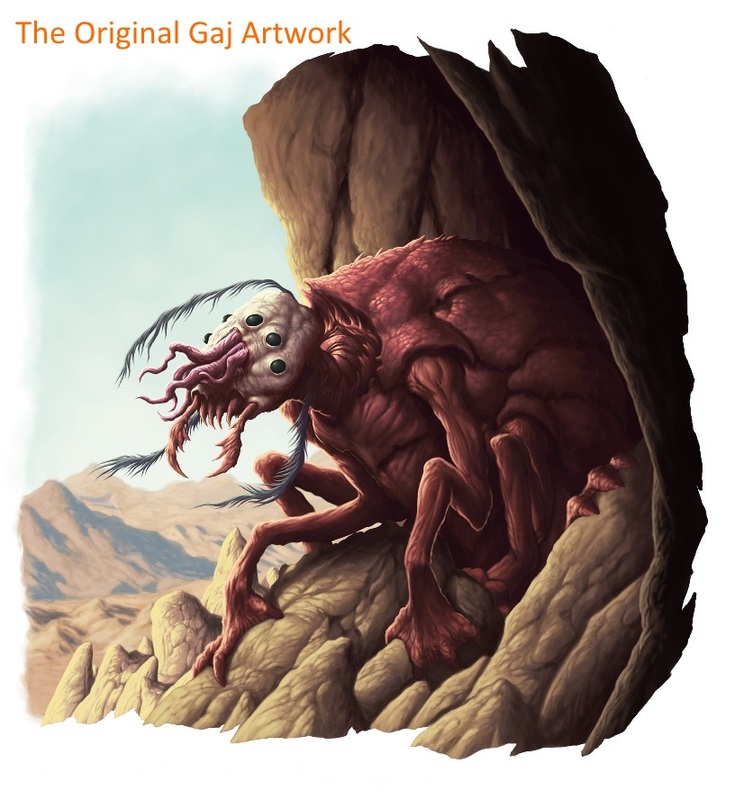 Dark Sun is a campaign world that has been shown a lot of love across all kinds of RPG additions from 2e, 3e, 4e, 5e, and even Pathfinder. This has lead a group of us to come together to recreate this campaign setting in a 3D game world using NWN. Just passing through to say that this looks incredible! It’s a labor of love for sure, and it shows. Good luck. 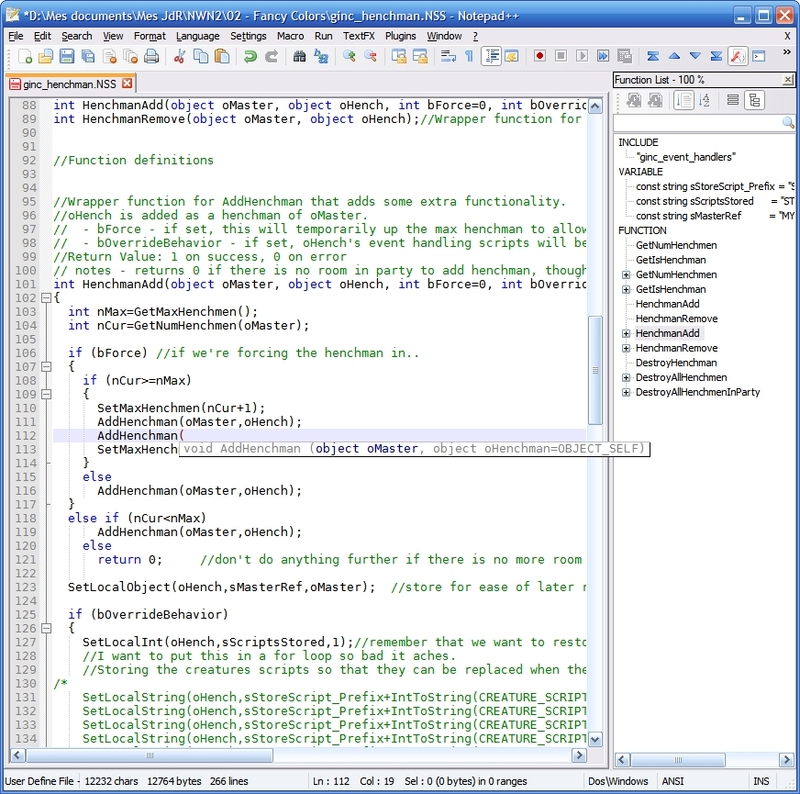 We are still hard at work on recreating Dark Sun using NWN as you can see from the screenshot below. This screenshot is of the desert tileset I’m currently working on/creating for Dark Sun. Second “Nairn” has joined our team taking on the role of lead scripter. This is very exciting for us because scripting was really our weakest area up to now. So we have now started working on all the core scripts to bring everything together. 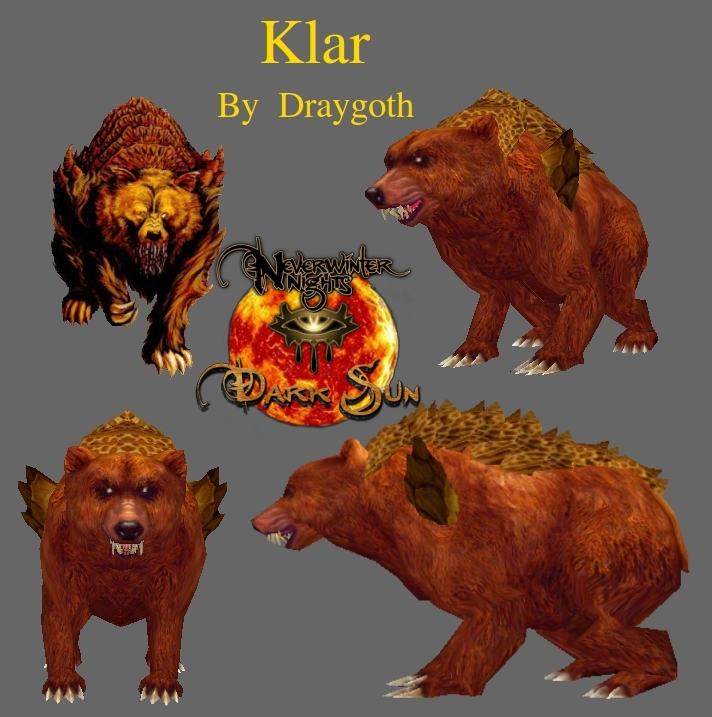 We wanted to create a mekillot that looked really cool why trying to stick with Brom’s art. 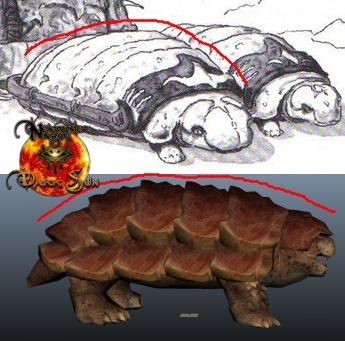 Now I’m not saying that our Mekillot matches Brom’s art work, however I really feel that we got the over all look while creating a massive creature that looks amazing in the game. We have a nice core team but we are always looking for more people would would like to work a long side us and help to bring this world to life. If you or anyone you know might be interested just let me know.